Telstar has been making noise recently with their Predicta TV line, and deservedly so. I'm in love with the in-development Chalet model, which is described as "a tribute to the great American Icon, the Drive-In Theater." What's particularly cool about the Chalet is that the 18" color picture tube can be tilted up and down, and also turned right or left, so you can make sure the screen is just-so for any seat in the house. 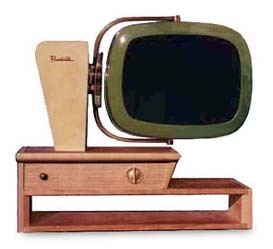 These new Predicta TVs are based on the original Philco Predicta, manufactured from 1958-1960. Those are collector's items now, which is to say hard to find, expensive, and difficult to maintain. The new Predictas come with modern electronic guts, so they retain the classic lines of the original but not the classic problems. Although the new Predictas will work with modern day equipment like satellite TV and VCRs (mercifully they have remotes, too), there isn't an HDTV model at the moment, and the sizes are limited to 18" and 24". So if you've had your eye on a 42" flat panel display, I doubt you'll find these sets compelling. The Predicta Web site doesn't list prices, but does say the new TVs cost less than the 1958 version (indexed for inflation). It also says they are "not priced with the cheapest TVs you can find." It further says they are "priced to be comparable with the average high-end TV you would find in your local TV store." In other words, you need to have been putting aside money since 1958 if you want one. I contacted Predicta a few months back for pricing information. They quoted the Chalet model at $2099; other models varied from approximately $1400 to $3300, with additional fees for custom finishes and shipping. They go on to say they build in two-month cycles and have six builds a year, so you have to get your order in a few months in advance. I queried them this past April, and they said the next available build slot was September-October 2004. They're really beautiful products, aren't they? But with the whole tube-set era coming to an end, Predictas seem a little too retro to me, no matter how gorgeous their outer shells are. I had a Predicta Princess built for me. It had a scratch on the screen, approx. 2"x1/4" when I received it. It was under the plastic protective cover on the screen, so it wasn't scratced in transit. Although they did offer to have me send it back, I was amazed that a custom built set would have this problem. They were very offensive when I advised them of this problem, as if I had done them a disservice. After 3 years a problem arose, the menu keeps on popping up every 15 to 30 seconds, and you have to run thru the menu options to get back to the program you are watching, but by then the menu pops up again. I am having a very hard time having the set repaired.